After thwarted an armored car robbery, Miguel intervenes when a group of thugs assault young woman. After he fights off her attackers, she seems oddly ungrateful and chastises him for interfering leaving Miguel very confused. 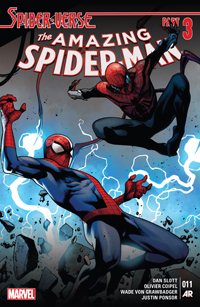 Five page back-up/prequel included in the first issue of Amazing Spider-Man (2014). This issue has a ridiculous number of variant covers. If you really want to see them all, go here. Settling into his current situation of being trapped in the past, Miguel rents an apartment in New York city. The super of the building turns out to be Tempest, the young woman he saved from some muggers previously. Back at Alchemax, an armored figure enters the building asking to see Spider-Man 2099. When he encounters resistance, he deletes the individual from the timeline. When the alarm goes off, Tiberius hides in his office's safe room, leaving Miguel alone with the assailant. The armored figure identifies himself as an T.O.T.E.M* adjustor from the year 2211. The adjustor has come to delete Spider-Man 2099 from the timeline. The two battle across the offices of Alchemax until they reach the office of Liz Allan. When the adjustor sees her, he makes Spider-Man an offer. Let him delete Liz Allan instead, and he's off the hook. Spider-Man feigns agreement and turns the adjustor's weapon against himself just before he blasts Liz resulting in the adjustor deleting himself from the timeline. After the incident, Liz concludes that Spider-Man 2099 must be an employee of Alchemax and begins to investigate who he really is. 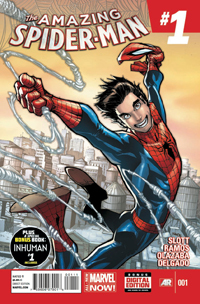 Issue was released with a number of variant covers, including one by original series artist and co-creator Rick Leonardi. To see all the covers, go here. Miguel lives in apartment 2099. Time travel in 2211 is illegal. A trip to the bank results in Miguel having to foil a hold-up. Afterwards, Miguel visits the apartment of Tempest in order to learn more about her and find the reason for her odd behavior. A cursory glance at her mail, filled with medical bills, leads him to conclude she's sick. When he tries to question her about it, she throws him out. Waiting for Miguel back in his own apartment is his boss, Liz Allan. She begins to question Miguel [or Michael as she knows him] about his past. Liz has done a thorough background check on him and discovered that he's using an assumed name and SSN. Miguel contemplates killing her by throwing her out the window, but opts otherwise. Ultimately Miguel tells her the whole truth. He tells her his real name, that he is from 2099, and that he is trapped in the present, and that Tiberius is his grandfather. When Miguel asks what she wants in return for keeping his secret, Liz kisses him on the lips and then leaves. Tempest arrives after Liz's departure and tells Miguel about her condition. She has Leukemia and only a few months to live. 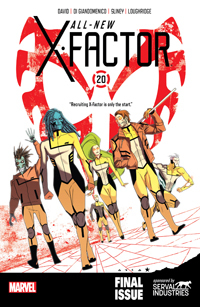 Issue was released with a number of variant covers, including one by veteran 2099 artist Pasqual Ferry (Fantastic Four 2099, 2099: World of Tomorrow). To see all the covers, go here. Miguel is ordered by Liz Allan to accompany Tiberius Stone to the country of Trans-Sabal, the nation they are selling the Spider-Slayers to. On the trip there, Miguel tries to convince Tiberius of how wrong the deal is, however Stone remains sure that once the Trans-Sabal government has the Spider-Slayers, the rebellion in the country will end, thus saving lives. The pair are attacked at the airport upon arrival. Rebels take Stone at gunpoint. Using a subcutaneous transmitter he implanted, Miguel is able to easily track where the rebels take Tiberius. At the rebel HQ, Stone meets the rebel leader, Mussaret. She gives Stone an ultimatum. Record a message cancelling the sale of the Spider-Slayers or die. Stone agrees. Mussaret also suggests to Stone the idea that he give the Spider-Slayers to her people instead. Before he can respond, the rebel HQ is attacked by Alchemax's hired security for Spider-Slayer sale, the Scorpion. Scorpion plans to rescue Stone, but with severe collateral damage. Miguel intervene in order to stop needless deaths. Scorpion confuses Miguel for the present-day Spider-Man and gladly engages in battle with him. He also reveals all of Alchemax's Spider-Slayers are at his disposal. You guessed it...more variants. To see them, go here. 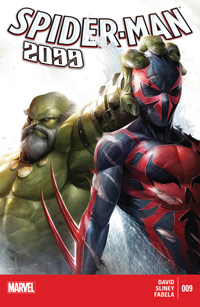 As the battle between Spider-Man 2099 and the Scorpion moves into the streets of Jaffan, the capital of Trans-Sabal, Tiberius Stone remains inside the rebel HQ. The building made unstable by the battle begins to fall apart. Mussaret saves Stone's life by diving to cover him from some toppling debris, but at the cost of her own life. Outside, Miguel is able to evade the Spider-Slayers by using Lyla cover his Spider-Man costume with a hologram of his normal clothes. Scorpion however begins to take hostages and demands he reveal himself, else he will kill civilians. Miguel manages to trick the Spider-Slayers to turn on the Scorpion by webbing Lyla onto Scorpion's back as she projects a holo-image of the present day Spider-Man over him. Stone emerges from the rebel HQ and deactivates the slayers just as they overpower Scorpion. In the aftermath, Miguel retrieves Lyla and slips back into his Mike O' Mara holo-clothes. Later, the dictator of Trans-Sabal meets with Stone and promises to bring to justice the rebels responsible for the attack. He also inquire about replacements for the Slayers that Scorpion destroyed. Stone takes this moment to tell him that he's changed his mind about the whole deal. In fact he gives the man one hour to pack and leave before the Slayers become active and kill him, effectively ending his rule over Trans-Sabal. Variant cover...you know the deal. Go here. When the Horizon Labs building is destroyed in a temporal implosion, Otto Octavius, the "Superior" Spider-Man is flung into the future year 2099. There is he befriended by Gabe O'Hara, who wants his help in bringing back Miguel, who from his perspective, has disappeared. Otto takes up residence in the remains of Empire State University to work on getting home. Gathering technology from Alchemax and Stark/Fujikawa Otto is able to create a device which he thinks will get him home. However on first try he instead finds himself on an alternate Earth. As he continues try and find his way back home, he quickly discovers that the Peter Parker of each Earth he visits has been killed. Someone his hunting Spider-Man across the multi-verse. Otto decides to visit other alternate Earths and recruit what Spider-Men he can find into an army to combat the hunters. 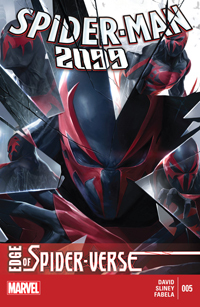 Not a Spider-Man 2099 appearance, but the story is set in 2099 and leads into the Spider-Verse event. A street sign gives the date as September 27, 2099. 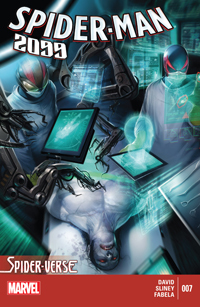 When inquire about time-travel technology, reference is made to the events of Spider-Man 2099 Meets Spider-Man. Virtual Unreality is also mentioned. Otto continues his campaign to recruit Spider-Men from the multi-verse to fight those who hunt them. 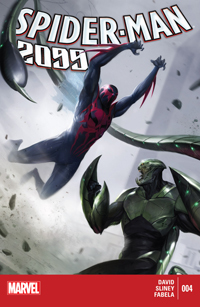 On Earth-98120, Spider-Man 2099 is killed by the dimension hopping Morlun. The death is felt by Spider-Man 2099 (616) while he is in the midst of stopping a bank robbery escape. Back on Earth-98120, Morlun senses that someone is watch him. 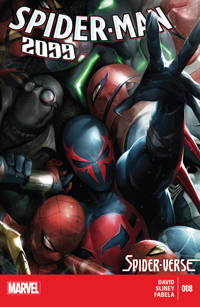 It is Spider-Man 2099 of Earth-6375, the one who traveled with the Exiles team. From his current Earth, this version of Miguel is attempting to use left over Exiles tech to find a way to locate and contact other versions of himself. Back on Earth-616, Miguel is criticizing Tiberius for using Alchemax to employ super-villains. Miguel suggest instead of employing super-villains, the company should try building better prison facilities. The suggestion is taken seriously by Tiberius and Liz Allan. However Miguel suddenly feels faint. On Earth-96099, Morlun kills yet another iteration of Miguel. Back on Earth 616, Miguel heads to the roof of the Alchemax. Once there, he sees a portal open. The Miguel of Earth-6375 is about to enter 616 when Morlun sneaks up from behind and kills him. Miguel (Earth-6375) arrives a limp corpse at Miguel's (Earth 616) feet. Miguel concludes he needs to go and see Peter Parker. 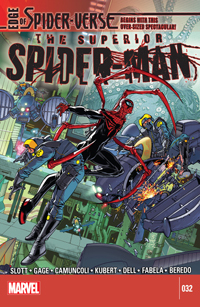 Rick Leonardi, co-creator of Spider-Man 2099 serves as a guest-penciler this issue. He also provides a variant cover which you can see here. 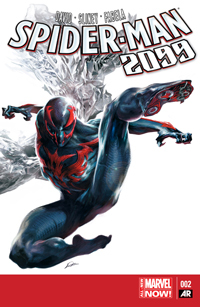 Spider-Man 2099 (Earth-98120) first appeared in Avengers Forever #12. 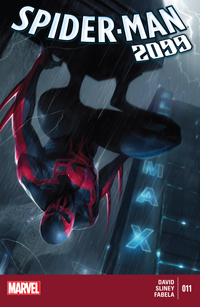 Spider-Man 2099 (Earth-6375) first appeared in Exiles #75. Miguel O' Hara (Earth-96099) first appeared in Marvel Knights Mutant 2099 #1. Miguel, along with the other Spiders of Earth-616 seek out Peter Parker. 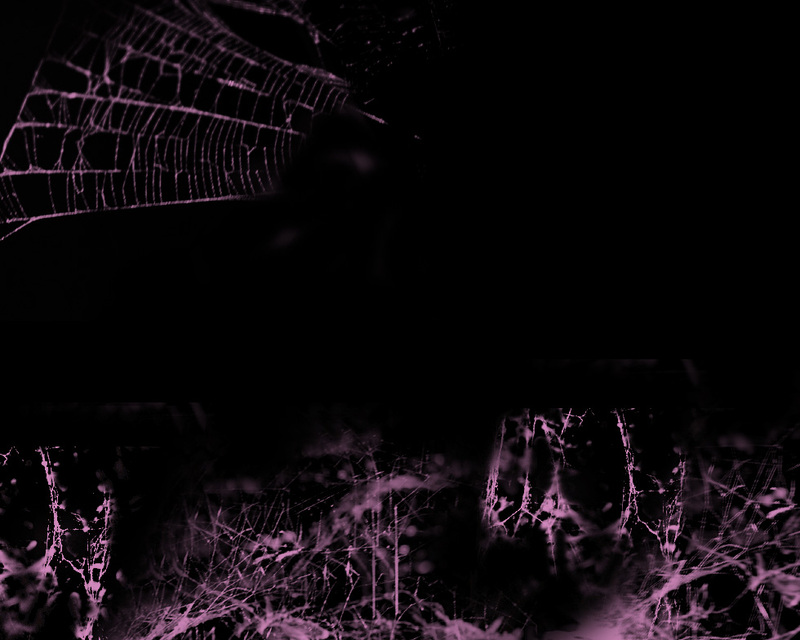 They are met by the Spiders of other dimensions and taken to a safe dimension to plan against the Inheritors who are hunting them. Miguel and several other Spiders follow Peter as he meets with the other group of Spider's who have been gathering. To Peter's surprise, the other group is led by Otto, the Superior Spider-Man who is hiding in Miguel's home, the future 2099. Otto's team succeeds in killing the Inheritor, Daemos. However they quickly learn that upon death, they move to a freshly cloned body. 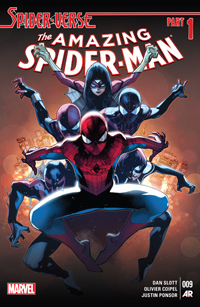 Miguel, the six-armed Spider-Man, and Lady-Spider agree to take Daemos' corpse to dissect it and learn more about their enemies, but cloned Daemos follows them. 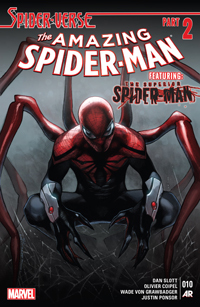 Miguel returns to 2099 for the first time since Superior Spider-Man #17. While on the run from Daemos, Spider-Man 2099, Lady-Spider, and the six-armed Spider-Man get a call from 616 Peter Parker. Spider-Man 2211 can be seen briefly in the background of some panels. 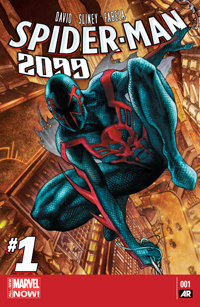 In 2099, Tyler Stone is informed by the Public Eye that Spider-Man 2099 is back. He orders him stopped. Accompanied by a six-armed Spider-Man and Lady-Spider, Miguel travels to his brother's apartment. There is fills in Gabe on the latest and plans to contact allies to help him against Daemos, the inheritor who is hot on their trail. Before he can contact anyone, Daemos breaks into Gabe's apartment. 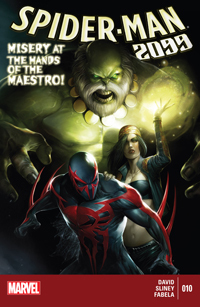 The six-armed Spider-Man is the first to attack him, but Daemos quickly overpowers and devours his life-essence. Lady-Spider tries to buy time for Miguel to escape, but again she too is unable to defeat Daemos. Just as the Inheritor is about to devour Lady-Spider, Gabe blasts him out of the apartment with a high-powered weapon. While Daemos is distracted by some Public Eye fly-boys, Spider-Man 2099 communicates with Tyler Stone and arranges a trap for Daemos at Alchemax. Luring Daemos to the Alchemax building, Spider-Man 2099 and Lady-Spider manage to trap the Inheritor in a stasis cell. Gabe says the weapon in his apartment belongs to Dana. Although he and Dana were in a relationship, she's never shown an interest in guns before. Its possible PAD meant for Gabe to say Casey, Gabe's girlfriend and someone who was much more likely to leave a big gun in his apartment. Peter puts in a call to Miguel to see what he's discovered from his dissection of Daemos. The call is cut off by Lord Jennix, of the Inheritors. Miguel and Lady-Spider arrive in the former safe zone and discover the remnants of Leopardon, the giant robot of Spider-Man from Earth-51778. They decide to repair the robot and take it to Lady-Spider's home dimension, Earth-803. 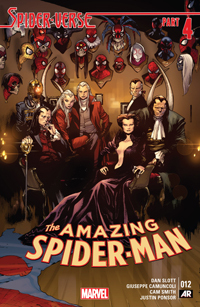 In this Earth, the year is 1895, and Lady-Spider (real name May Parker) convinces Harold Osborn to loan her the laboratory which belongs to his father. Harold agrees on the condition that May will have dinner with him. Harold tells his father, Norman, about the deal. Unknown to May, Norman is the Green Goblin and he calls together the Six Men of Sinestry to ambush Lady-Spider in the lab. Miguel and May battle the villains and defeat them. 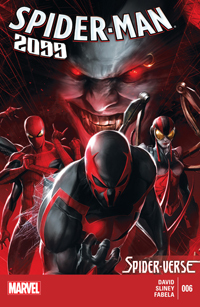 Culling technology from the six villains, May and Miguel are able to repair the robot and join the other Spider-Men for the final battle against the inheritors. 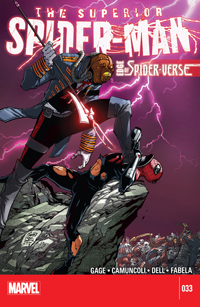 With the scion, bride, and the other all captured by the Inheritors, Peter decides to launch a attack on Loomworld. 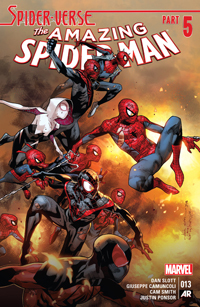 Peter calls in all remaining Spider-Men to join him, including Miguel. Miguel and Lady-Spider join the army of Spider-Men who are battling the Inheritors on Loomworld. They bring the repaired Leopardon into the battle. 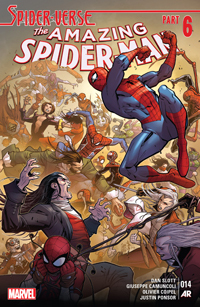 After the Spider-Men are victorious, Miguel concludes they can use the web of destiny to return all the Spider-Men to their respective home dimensions. 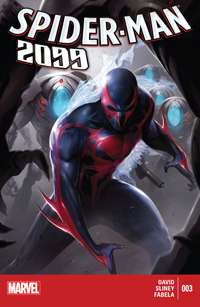 Following the events of Spider-Verse, Miguel returns home to find 2099 a wasteland. Attacked by scavengers, Miguel defeats them and forces them to take him to their home. On arrival, the scavengers are surprised to find their camp abandoned. They are quickly surrounded by armed men. The scavengers are captured, Miguel meanwhile resists them. Eventually the armed group's leader makes his entrance, Maestro. Maestro believes Miguel to be the original Spider-Man, from the past. The Maestro wants Spider-Man's help to go back into the past. The two battle, but Miguel is out-matched by Maestro's strength. Maestro comes close to killing him. Deafeated, Miguel is taken captive back to Dystopia. Along the way Maestro tries to learn more about how Spider-Man arrived in the year 2099. Miguel manages to ask him how the world ended, and learns that Alchemax is responsible. After arriving, Maestro throws Miguel into a prison cell with an old friend, Strange 2099. Miguel recalls the events Time Flies. In the prison cell, Spider-Man asks Strange about what's happened. Because she is a sorceress, she was unaffected by the change in time, but recognizes that something did happen. Strange uses her powers to heal Spider-Man and together they escape the cell. Spider-Man's plan is to return to 2015 to try and find out what happened in the past to change his future. Strange leads Spider-Man to the Maestro's trophy room, where he has Dr. Doom's time machine stowed away. Using left over Stark technology on display in the room, Spider-Man is able to repair the device which activates the time platform. Just as Spider-Man activates the platform, Strange is killed by an invisible opponent. Maestro reveals himself by removing his cloak of invisibility (formally belonging to The Hood). Spider-Man attacks Maestro using a gauntlet from the Hulkbuster armor and seemingly kills Maestro before travelling back to the year 2015. Back in 2099, Maestro arises unharmed by Spider-Man's attack. The ploy worked, and he now has a working time machine. Strange likewise arises, her appearance different as she is possessed by another being. Miguel accompanies Tiberius to a meeting with Serval Industries CEO Harrison Snow. Much to Miguel's surprise, he recognizes Harrison as Harry, a Alchemax employee from 2099. Harry and another employee, Barry Huff, were experimenting with time travel. Both vanished without a trace and were presumed dead. Harry explains they traveled back in time. Barry wanted to return back to 2099, so Harry sent him home. Miguel explains that the 2099 they knew is gone. He also demands to know what he's doing in 2015. Harry explains that his plan is to recruit every mutant and super-hero in the world and turn them against Alchemax and destroy the corporation. Miguel sneaks into Tempest's apartment, in costume, to administer a cure to her cancer. She awakens after he sprays the cure on her and throws him out at gun point. The following day, Miguel returns to his day job at Alchemax. He learns of the company's latest venture, prison building. He also learns that a rival company is also competing for the city's money to build the prison, Peter Parker's company. Miguel visits Peter privately and urges him to win the bid. He fears that the prison Alchemax wants to build may play a role in the destruction of his future. At the end of the day, Miguel decides to visit Tempest. He finds her intoxicated after heavy drinking to celebrate her being cured of the cancer. Tempest makes advances on Miguel in her drunken stupor and eventually kisses him. Not wanting to take advantage of her, Miguel tries to push her away, but she bites him. She then physically transforms into a human/wasp-like creature who hungers for him. The transformed Tempest tries to devour Miguel. He leads her out of her apartment and into Central Park. After consulting with Lyla regarding her mutation, she hypothesizes that the transformation can only be temporary. Tempest runs into a police woman who she promptly takes hostage in an attempt to get Spider-Man to surrender himself to her. Spider-Man picks up the police woman's gun and shoots the cop through the shoulder in order throw Tempest off balance. Pushing her into the nearby lake, their fight continues until Spider-Man manages to knock her out. Pulling her out of the water, he's pleased to see her return to normal. He's less pleased to be surrounded by police, but he manages to flee them without incident. After returning Tempest back to her apartment, she awakens. Spider-Man questions her to see if she remembers anything. She claims to remember nothing. After Spider-Man leaves her, she wishes him a good night, using his real name. I would have placed the events of the current series during Spider-Man 2099 #26, prior to his leaving with Xina to Nightshade. That's the only time frame which I think meets those conditions. However subsequent developments have made it more difficult to slot this in the context of the original series. Miguel teams up with Strange 2099 (who he first met in #32) and refers to Venom 2099 in the past tense (the whole Venom saga is #35 - 39). This is incongruous with Stone still being in charge since we never see him take office again. Also Stone's personal assistant, Winston, is ostensibly dead by Venom's hand in #36 yet he appears alive and well the new series. One possible way to reconcile these seemingly incongruous details is that the series takes place after Spider-Man 2099 #44 (Peter David's last issue on the original series). Its possible he could be ignoring everything which came after his last issue. Its not a big stretch of the imagination that at some point after #44 Tyler Stone regains his position in Alchemax. Back in the VP chair, Tyler is unlikely to keep Conchata as his assistant, hence bringing Winston back (who may be more robotic than human and just needed repairs...or maybe they sell Winston's by the boatload in 2099). This would leave only one small problem. Back in Superior Spider-Man #17, Miguel specifically says that Tyler doesn't know that he knows that he is his biological father. That thought balloon ignored...and everything can fall into place with a little imagination as to what events may have transpired after #44 of the first volume. A second possibility is that the events of the original series have been altered. History...including future history...is in flux. Therefore events may not have happened as we remember them. For now, as readers, we just need to roll with it. Until such time as it becomes clear in the current series from whence this Miguel hails from, I am listing these appearances separate from the original series.